The BOSS Techsystem featured in the DATBOSS antenna, automaticcally controls the level of the received signal (either very high or very low) in order to always ensure an optimal output level. Its new design with TForce technology, makes this intelligent device even more versatile: IT STANDS OUT FOR: Low power consumption in intelligent mode. Filtering compliant with 1st (LTE790) or 2nd (LTE700) Digital Dividend MAIN FEATURES: HIGH DYNAMIC RANGE: it allows you to receive high-quality TV in a variety of critical situations, from areas where signals ae very weak to installations with high reception levels. DTT COVERAGE ENHANCEMENT: up to 27% higher than older models. 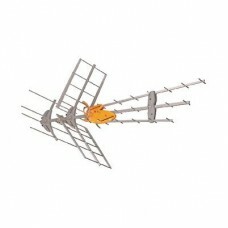 A MORE STABLE RECEPTION: it supports signal variations or fading with no effect on the TV installation. ÓPTIMAL C/N: thanks to a noise figure of only 1.2dB that respects the received signal quality. 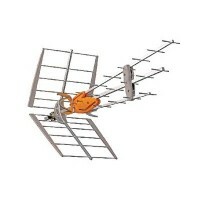 VERY HIGH GAIN: TForce increases the gain of the antenna in 13dB, in UHF and III Band. OTHER FEATURES: Intelligent mode or passive mode work options (lack of power supply). DAT design, based on 3 Yagis antennas with asymmetric directors, provides great directivity as well as an optimal anti-echo radiation pattern. Special double-U dipole: it’s open/close format provides optimal frequency response flatness. A fully shielded switch box protects the BOSS system from impulsive noise; grounded for full protection against electrical discharge. Manufactured in aluminium (stainless) for a long service life. Antennas provided in multiple packing include both a structure folding mechanism and a cam mechanism in the antenna base to optimize transport and storage, while making installation easier. Fully automated manufacturing subject to strict quality control. This filter is a high barrier filter for LTE with smooth frequency responseand very sharp edges. Re.. IN HOME CAI-VERSTERKER MET VIER RETOURGESCHIKTE UITGANGEN HV 14 shop Duurzame en energiezuinige mult..